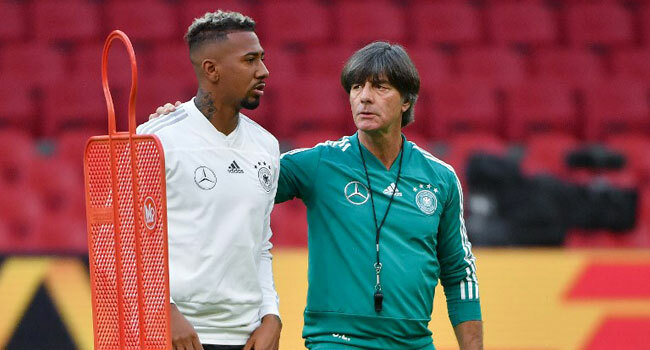 Long-time Germany stalwart Jerome Boateng has been left out of national coach Joachim Loew’s squad for internationals in November and been told he could do with a break. “I have spoken to Jerome Boateng and I’m convinced he could do with a good break,” Loew told a press conference after naming his squad for a friendly with Russia on November 15 and against the Dutch in the Nations League four days later. “The team needs pepping up and it’s my job to do that. I’m certain there will be many more changes too before Euro 2020,” he insisted. “After a private conversation we agreed it would be best if I took a break after what has been an exhausting year, which will allow me to focus on Munich,” the man with 75 caps to his name said on Twitter. “He puts in a great deal of energy, which is why he is still in the team. But of course, he is subject to competition for his place,” he said. Strikers: Leroy Sane (Manchester City/ENG), Mark Uth (Schalke 04), Timo Werner (RB Leipzig).